Being an empath means you not only feel your own stress but the emotions of everyone around you. Suggestions for how to thrive, not gain anxiety weight and stay true to yourself from a medical intuitive. 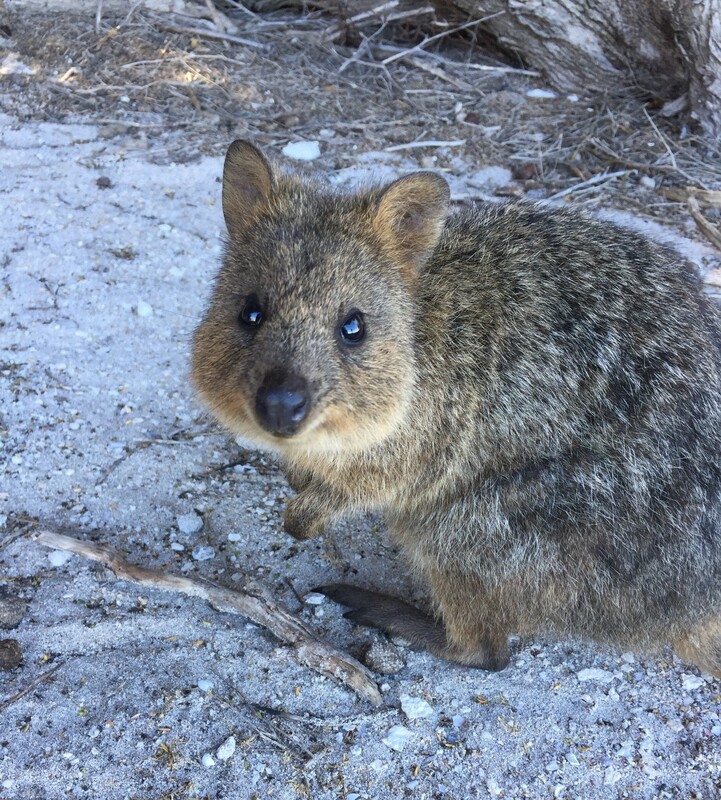 This is a Quokka, an exceptionally cute marsupial found only on an island off the coast of Perth, Australia. Research has shown that spending time with animals can significantly reduce stress and thus levels of cortisol, whereas stress causes increased adrenal activity. Cortisol creates weight gain, insomnia, fatigue, brain fog and other unpleasant symptoms. If you are gaining weight right now in spite of no change in caloric intake or exercise, that is yet another thing to be angry at Trump and his minions for, but anger just creates more cortisol. I raised rabbits for shows when I was younger and spending time with them every day definitely helped me cope with the stress of living in a dysfunctional family. I wholeheartedly advocate spending time with your animals, talking to them even if they don’t answer back and even borrowing pets from friends or hanging out with squirrels, birds or insects, if you don’t have creatures of your own. I’m in Australia for only a few weeks helping my daughter get ready to spend the next year here for college study abroad. Just watching her interact with the Quokkas, popular selfie subjects (google it, it’s hysterical), made me relax and smile. Smiling and laughter are wonderful reducers of cortisol. As an empath during the days of 911, I remember feeling the energy of all of the people who were dying in the attacks and the fear, sadness and helplessness of our fellow citizens and the world. That’s one of the downsides of being an empath. We pick up feelings from everywhere, often without realizing it, making it difficult to distinguish our own personal feelings. My first suggestion would be to label your feelings, figure out where they are manifesting within your body (they always do) and critically think about whether they apply to your present situation and in the magnitude you are experiencing them. Visualize a protective energy wall around yourself and set the intention to block and release what doesn’t belong to you or serve you. Grounding is also essential so that your thoughts and energy remain on the earth where you can properly process them. There are many different grounding exercises online but you can walk outside barefoot, on the earth or in water, spend time in nature, do Kundalini yoga, buy an inexpensive earthing mat (great for bad weather), pray, meditate and more. Prayer and meditation are also incredible tools since they help us stay in the moment, have faith in something greater than ourselves and also reduce cortisol. I can’t emphasize self care enough. Practice healthy eating, reducing or eliminating sugar and caffeine, getting a massage or reiki if you can and giving yourself a nice treat, like a manicure or art class. Don’t be afraid to ask for help. Going to counseling is an indicator of mental health. Avoiding it when you need it isn’t a sign of strength. Also, don’t forget to move. Exercise isn’t just good for physical health, is releases stress and energy that builds up in the body. Getting off of social media before starting to feel overwhelmed is also crucial. This is common sense but empaths need to be especially aware of how much picking up the feelings of others impacts them. We are not only connected via the World Wide Web but also energetically. You can be informed without letting it make you crazy. Easier said than done I know but it is possible. Taking action when you can like writing letters, making phone calls, participating in demonstrations and more help us feel less helpless, like we are doing something. Fighting against an entire group of bureaucratized government officials is daunting and seems impossible. Become part of a group of like minded warriors who can motivate each other, listen to venting and work together. Finally, the most important piece of advice: Stay connected to your intuition or establish a connection if you don’t have one. I teach various methods of doing this to my clients but above all it is about being true to yourself. Take time to be with only you so you can listen to what you need. The best guidance comes from inside. I’m writing a book about becoming a medical intuitive and licensed counselor, knowing I was an empath with medium abilities at a young age and surviving a dysfunctional family while recovering from an eating disorder and depression using Carl Jung’s Analytical Psychology. The book will include specific, practical techniques and strategies using Jung’s innovative and original ideas, which continue to serve me and my clients with great success.